Bursting with ideas and inspiration, Exploding Whale’s retailored model of Shakespeare’s most frequently performed comedy reveals a wealth of new talent. Hidden beneath Katzenjammers’ Bierkeller, Katzpace is an interestingly-located, if somewhat incommodious studio space and home to this vibrant young theatre company. The modern corporate setting of this adaptation is an excellent choice as a venue for social intrigues as well as a vehicle for the shifting of traditional gender roles. In this version, Don Juan is a female executive and several minor characters have become women in the workplace. Director, Ellie Morris, creates beautifully contrasting moods while the story unfolds. As they arrive for work, each personality is immediately established and the spirited pace allows for an atmosphere of bustling office banter. However, it is never a mistake to take time over establishing complicated backstories and plots; even for those familiar with the play, the energy of the opening rushes through the initial set up as we learn the latest line-up. The first half plays actively on the comic element with quick-witted interaction and lively, farcical staging, though sometimes the quality becomes patchy and we lose the tension and conviction of the characters. In the second, the drama comes together and we experience an unusually powerful sense of tragic relief, sobering the mood for a dose of reality. In this redesigned cast, the two central couples find a perfect blend of tone and attitude which place them in the present day. 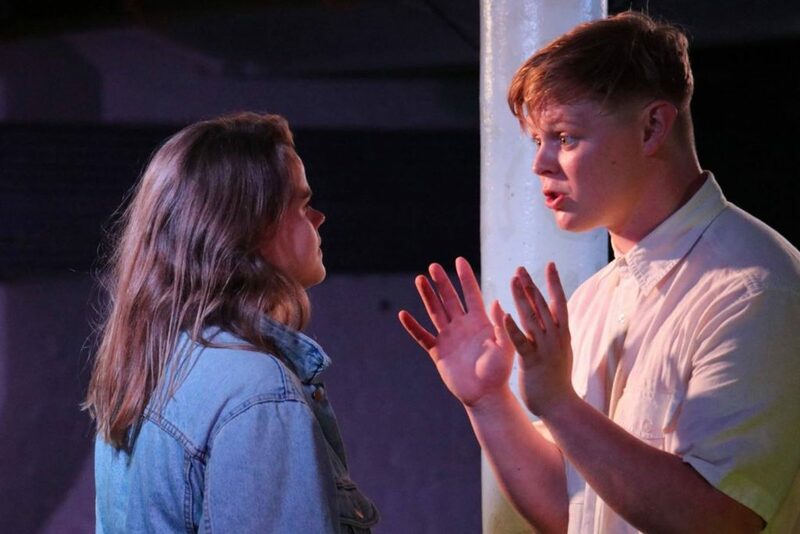 The nonchalant pretence of Talia Pick’s Beatrice complements Gregory Birks’ carefree, comic front as Benedick, breaking eventually in a touchingly affectionate scene. 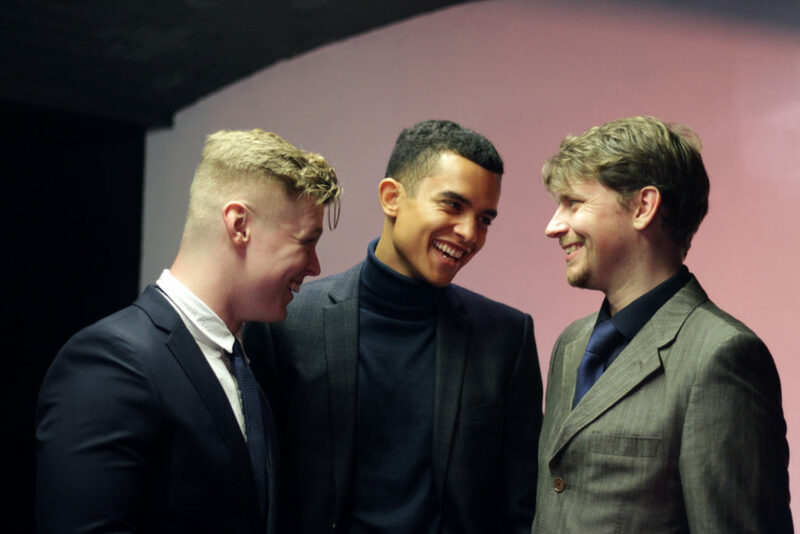 Ava Pickett as Hero and in particular, Julian Bailey-Jones as Claudio, grow with passion from starry-eyed young lovers, experiencing the powerful feelings of betrayal, anger and grief. Octavia Gilmore portrays a manipulating Don Juan and James Irving as Hero’s father, Leonato, asserts himself in the second half. There is an enjoyably quirky Dogberry from Charlotte Vassell, but many of the secondary roles are changed or omitted and the distinction and balance between their updated versions is not always clear. A room below a beer cellar is certainly a change from one above a pub but it has its practical drawbacks. Visibility is sometimes obscured by a couple of pillars and made uncomfortable by the glaring, low spot lights. Technical aspects aside, Exploding Whale’s production captures the fundamental essence of these two couples, exploring the timelessness of their relationships as well as putting more women on the stage. The clever, contemporary setting and details, dynamic direction and wonderful acting make this a ‘Much Ado’ which spans our emotions and entertains at the same time. Continuing their residency at the Katzenjammer Bierkeller, Exploding Whale’s production of ‘Let’s Get Lost’ (an original piece inspired by J.M. Barrie’s ‘Peter Pan’) follows the lives of Wez and her four closest friends in an imagined seaside town. The story takes place after the death of Wez’s Mum, and the supposed death of her brother, and shows how all the characters cope with loss, changing friendships and growing up. It is the first play written by cast member Bebe Barry, and only the second production for this budding company. Coinciding with the start of the Camden Fringe, London is currently awash with companies just like this, all aiming to put their mark on the over-crowded London theatrical map. Whilst many of these productions will go down as highly amateur, this will not be one of them. As soon as I entered the space I realised how excellent an idea it was to perform a play in a bierkeller. The huge underground beer hall was transformed into a lush green park, surrounded by fairy lights and deck chairs. Plus there was a bar with a wide range of beers at the back of the room. It was a refreshing and welcoming environment to walk into, and left the audience at ease that what they were about to see would be enjoyable and professional. The real triumph of this piece is how Barry has created characters that heavily contrast with one another, and yet very believably get along. Each character provides a different presence and energy, whilst also slotting into the dynamic of the friendship group seamlessly. This is an excellent indicator of both good writing, and a company of actors that work well together. The characters that stood out most were Pup and Alfie, played by Bebe Barry and Julian Bailey-Jones respectively. The energy both of these characters gave off was impossible to ignore, and provided the audience with the most enjoyable and satisfying moments of the play. By contrast however, there were too many other moments throughout where the energy was low, and the piece lacked the urgency that seemed necessary. It was commendable that a play centred on death didn’t focus too much on the negative; however it was a theme that wasn’t given enough severity or dramatic significance. These moments of low energy made the script seem amateur. If you are a keen theatre goer then chances are that you are going to see a lot of theatre this month. I doubt you will see any new companies who are as professionally organised and well produced as these guys. I do hope, however, you will get to see pieces and performances with more urgency and drama. Still, I see this show only getting better as they continue their run.